The first edition of the Barcelona Hypatia European Science Prize recognises Hungarian mathematician László Lovász for his contribution to science and service to society. The Barcelona Hypatia European Science Prize in its first edition recognises Dr. László Lovász, mathematician and President of the Hungarian Academy of Sciences (2014-present), for his outstanding career in the field of mathematics and for his contribution to social progress. 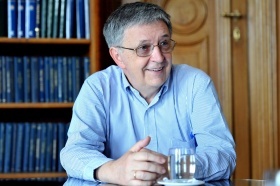 As President of the Hungarian Academy of Sciences since 2014 and current President of the World Science Forum (WSF), Dr. Lovász has been a champion of scientific freedom, having made significant, lasting contributions toward dialogue between science and society throughout the world. The WSF organises biennial conferences, with the next one scheduled to take place in Budapest, November 20-23, 2019. The name of the Prize honours Hypatia of Alexandria (344-415), a woman scientist and philosopher who successfully bridged and disseminated all scholarly disciplines known during her time and who, for this same reason, was assassinated by the forces of ignorance and fanaticism. Academia Europaea (AE) is a pan-European, non-governmental association acting as an Academy. Its members are scientists and scholars who collectively aim to promote education and research. Founded in 1988, it currently has around 3800 Members and features leading experts in a variety of fields, including the physical sciences, technology, biological sciences, medicine, mathematics, literature, humanities, social sciences, cognitive sciences, economics and law. The Barcelona Knowledge Hub (BKH), created in 2013, is the AE’s branch office for the Mediterranean and Southern European region. It promotes activities of interest for Members of the region as well as for the scientific community in general, with the goal of contributing to the consolidation of a genuine European area of innovation, research, and education. Its office is located in the building of the Institute for Catalan Studies, in the centre of Barcelona.